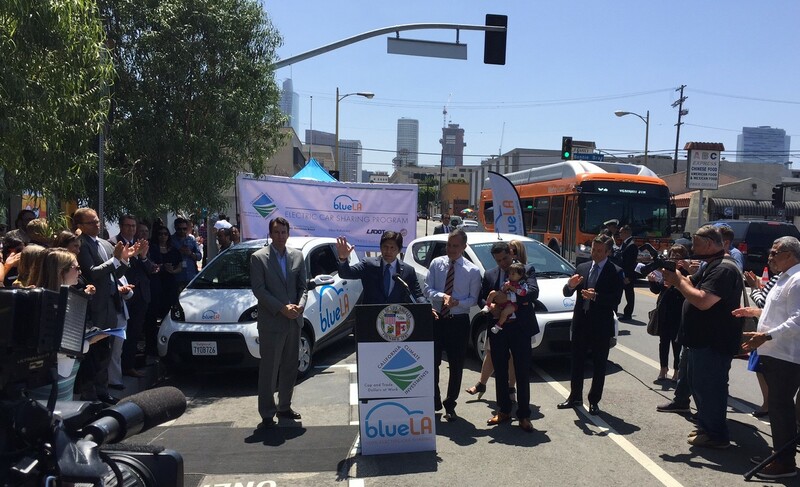 Leaders cut the ribbon on L.A.'s new electric car-share program for disadvantaged communities. 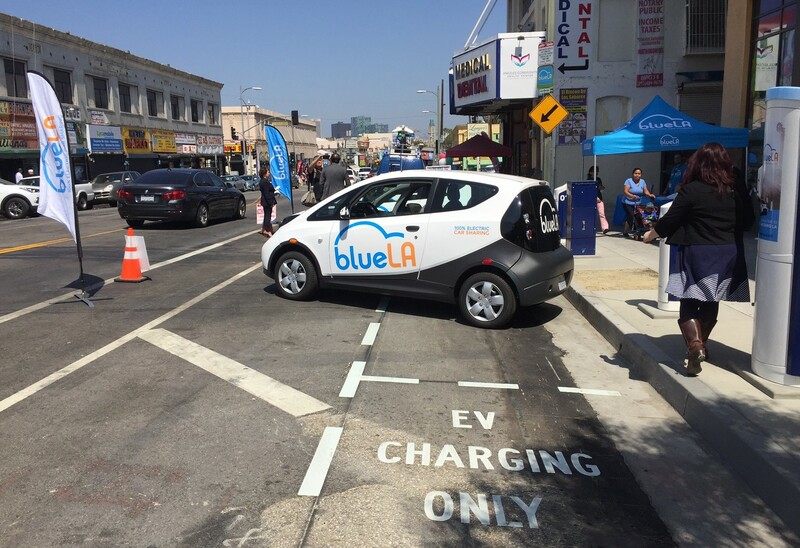 All photos: Joe Linton/Streetsblog L.A.
Today the city of Los Angeles and BlueLA launched a new program to provide electric-powered car-sharing for low income communities. This morning’s kick-off celebration was held on 7th Street in front of the MacArthur Park apartments, a transit-oriented affordable housing development. 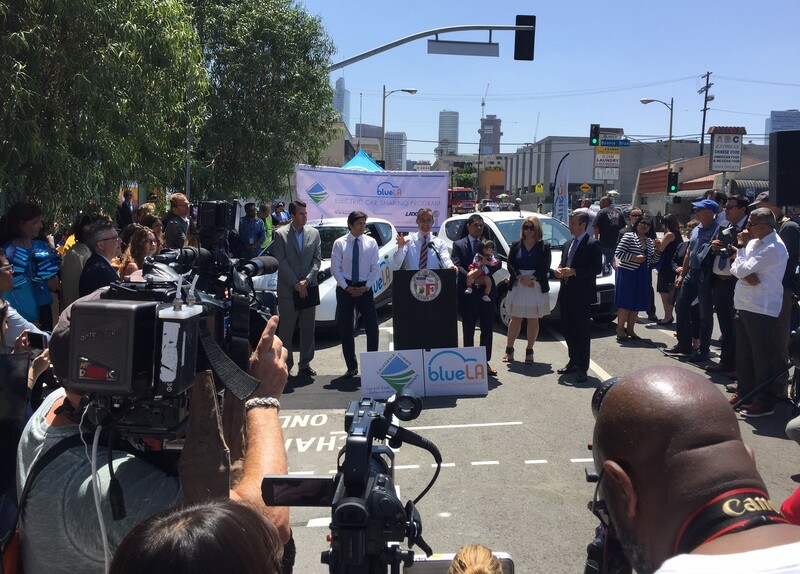 Mayor Eric Garcetti, an avowed electric car fan, declared that this project demonstrates the city’s commitment to putting “equity at the heart of sustainability efforts.” State Senate President pro Tempore Kevin de León praised the new program as an important part of state efforts to fight climate change. Without specifically naming U.S. President Donald Trump, de León passionately pledged that California is moving ahead combating climate change “with or without Washington,” that the state “believes in climate science and facts” and is committed to “defending family values” including keeping families together. Assemblymember Miguel Santiago, carrying his infant daughter in his arms, spoke on “democratizing technology” by bringing green projects into underserved neighborhoods. 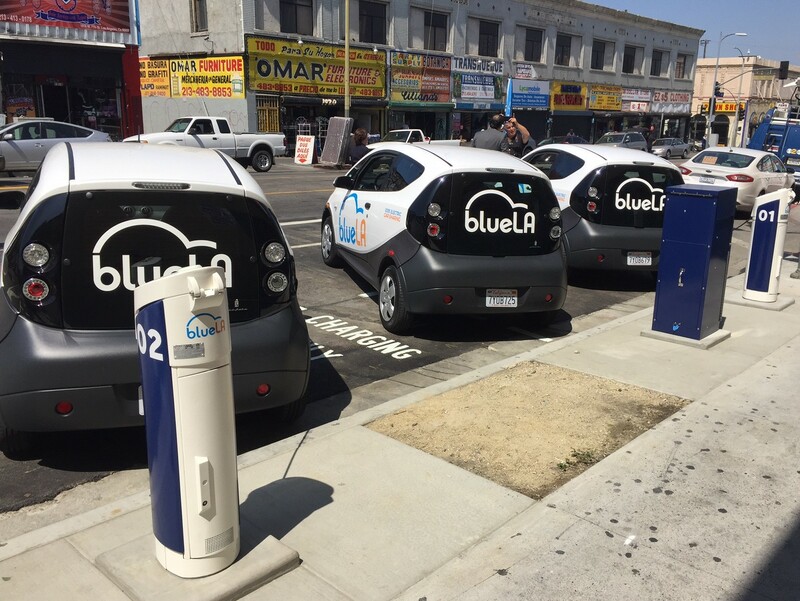 L.A.’s new car-share program is operated by BlueLA, a subsidiary company whose parent operates all-electric car-share in Indianapolis, as well as in cities in Europe and Asia. L.A.’s new car-share operates point-to-point, similar to bike-share docking. At build-out, the program will include 100 all-electric vehicles located at 200 dedicated on-street spaces equipped with electric charging stations. The funding for the project includes a $1.7 million grant funded by cap-and-trade, plus about $400,000 funded by the L.A. Department of Water and Power. I’m curious about the pricing. Will low-income folks be able to afford to use these cars? It’s likely to be significantly cheaper than car-ownership. If it gets marginal car owners to get rid of their full-time cars and use transit/bikes/walking + this rental system, seems like it could be beneficial for the city. Guess we’ll see what the happens with the pilot program. “What will it cost? Are there income-based discounts? Costs will vary, depending on which membership level is chosen, what discounts you qualify for, and how much time you use the car. Membership fees will range from $0 to $10 per month, and usage fees will range from $0.15 to $0.80 per minute of drive time. * Low-income users will be able to qualify for a 25-80% discount. So it seems that while there is a monthly fee, the minimum time usage for these vehicles is a great deal lower than Maven (no monthly fee, but in my experience between 1.5- and 2.5-hour minimums) and still lower than Zipcar (monthly or annual fee and half-hour minimum for one-way trips; one hour for round trips). As a person from a car-free household that uses carsharing as my primary vehicle, I think the biggest advantage BlueLA offers over its competitors (in addition to focusing on neighborhoods from a wider variety of economic levels) is that all trips are point to point (“one-way”), whereas Maven only offers round-trips in LA and Zipcar offers very limited one-way trips. I just hope the app is easy to use. And considering the requirement that all vehicles must be plugged in when they are being dropped off, I hope the act of plugging in the vehicle is what terminates the reservation, rather than having to engage in a two-step process using the app and the power station. Anything car-oriented generally wouldn’t be my first choice… but I think that car-share can reduce the need for car-ownership. When my wife and I were living in downtown Jersey City (which looks kind of like Brooklyn – most people don’t own cars there – very walkable) we didn’t own a car, and used walk/bike/transit daily – and used Zipcar car-share once or twice a month to get to suburban stuff like Trader Joes and Home Depot. I could and did bike to these, too, on occasion, but it was inconvenient. BlueLA car-share at this MacArthur Park could help families there to go from one car to none (or two cars to one). It’s not the answer, but I think it’s a step in the right direction. Can I charge my electric car at these stations or is it only for the blue dot cars?